Bangalore: India has culled at least 250,000 birds in Assam to contain an outbreak of bird flu among poultry, a government official said. Samples from two more districts where poultry died have been sent to a laboratory to confirm if the deaths are due to bird flu, Hojai said. Culling is being expanded to include two villages in neighbouring Meghalaya. 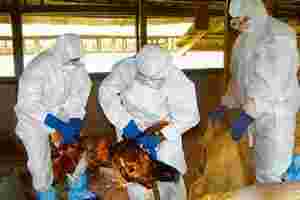 The virus was detected in poultry in a village near Guwahati last month. “Though no cases of bird flu have been reported in Meghalaya, we are going ahead with culling as a preventative measure," S.F. Khongwir, a senior official in Meghalaya, said. Millions of fowls have been killed in the country in the past three years following outbreaks of bird flu. The virus has spread from birds to humans in 15 countries, mostly in Asia, and is not expected to diminish significantly in the short term, according to the US Centers for Disease Control and Prevention’s website. Governments and the World Health Organization (WHO) are piling up medicines in case of an bird flu pandemic in humans. A flu pandemic could kill 71 million people worldwide and lead to a major global recession costing more than $3 trillion (Rs146.1 trillion), according to a worst-case scenario outlined by the World Bank last month. While no human cases have been reported in India, experts fear the H5N1 virus might mutate or combine with the highly contagious seasonal influenza virus and spark a pandemic that could kill millions of people. Since the virus resurfaced in Asia in 2003, it has killed more than 200 people in a dozen countries, WHO says. India, on 24 September, banned imports of some livestock and their products from nations affected by bird flu to prevent a fresh outbreak of the deadly virus.